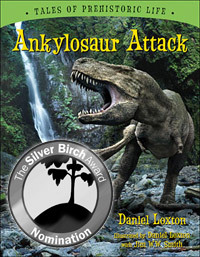 Ankylosaur Attack nominated for Silver Birch. ORDER THE BOOK. 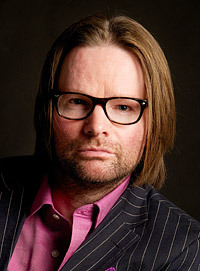 Daniel Loxton announces that his book Ankylosaur Attack is among the 2013 Forest of Reading Silver Birch Express Award nominees revealed by the Ontario Library Association. Daniel Loxton offers some “making of” insight into his first Junior Skeptic cover—completed 10 years ago this month. Recently, we posted Chris White’s 3-hour refutation of the theories proposed on the History Channel’s Ancient Aliens that claim we were engineered by extraterrestrials. However, the notion of a worldwide flood mentioned in the otherwise excellent documentary could use some debunking. In this week’s eSkeptic, Skeptic magazine’s Religion Editor, Tim Callahan, and our resident geologist Donald Prothero, debunk Noah’s Flood both from a mythological and geological standpoint. 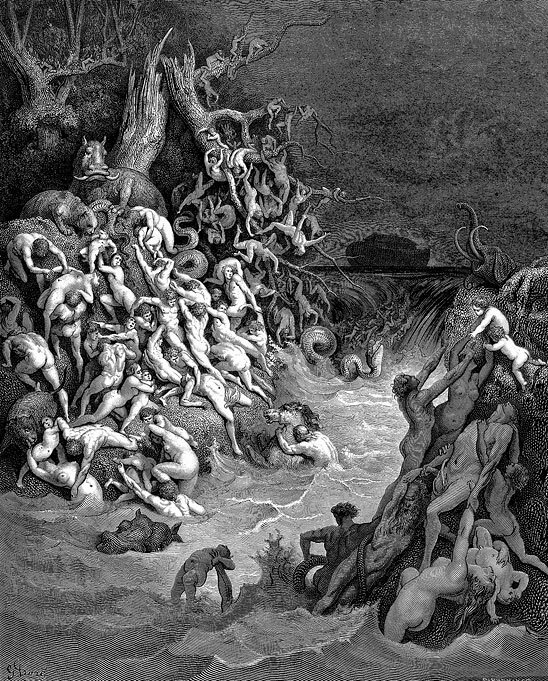 “The World Destroyed by Water” by Gustave Doré. One of the programs of the (so-called) History Channel that is particularly galling to me as a skeptic is their Ancient Aliens series, where Erich von Daniken, Zecharia Sitchen, Georgio Tsoukalos and David Childress, among others, advance the pseudo-scientific theory that extraterrestrials both created us through biological engineering and gave us our ancient civilizations. In the process of advancing their dogma, they spout blatant falsehoods that go utterly unchallenged. The History Channel, shamefully, makes no attempt whatsoever to offer any rebuttal to these spurious claims. Rather, as is their policy with any program dealing with the historicity of anything from the Bible, their policy toward ancient astronaut theorists is one of shameless pandering, a strategy most probably determined by favoring profits over proof and ratings over reason. Fortunately, filmmaker Chris White has addressed this imbalance, putting the lie to these claims thoroughly in his three-hour documentary Ancient Aliens Debunked, recently posted on Skeptic.com. Unfortunately, in one area in particular Mr. White has stumbled badly in his assertion that the biblical story of the flood is not derived from Sumerian flood stories (whose connection to the ancient alien series is thin in any case) and instead claims that both biblical and Sumerian flood stories reflect an actual worldwide flood and are not the result of cultural diffusion from some earlier myth. According to White, all over the world there is a universal myth of a worldwide flood in which only a few people, usually about eight, are saved by entering a boat, while the rest of humanity is drowned. White argues that, of course, one great drawback to such an assertion is that science in no way supports such a universal flood. Geology and the fossil record and genetics all militate strongly against any historical validity of a worldwide flood. Thus, comparative mythology is his only evidence on the offing. Are flood myths universal? No. At least, not one in which a worldwide flood wipes out all of the human race but for a couple or a single family. Consider the case of China. Does this large country with an unbroken history going back to ancient times have a flood myth, replete with a boat on which a few survivors escape, from thence to reestablish the human race? It does, however that particular flood myth comes from an ethnic minority called the Miao. They speak a language similar to Thai and appear to have immigrated to China from Southeast Asia. The only other flood myth from China involves annual flooding from rivers and the need for people to work together to prevent such destruction. It involves no ark and no destruction of all life on the planet. Consider also an Egyptian flood myth. Surely this one should be similar to those of the Bible and Mesopotamia if the flood were, in fact, historical. In this myth the gods, suspecting mortal treachery against them, dispatch the goddess Hat-hor to take vengeance on the human race. However, her blood lust gets out of hand and threatens to utterly annihilate humanity. Since this is not the aim of the gods, they pour out upon Egypt a flood of beer brewed from mandrake root, which has soporific properties. Hat-hor, setting out on her daily rampage, looks down at the flooded land of Egypt, sees her own beautiful visage reflected in the beer and bends down to kiss it. She begins to drink the mandrake root beer and drinks so much of it that she forgets the plan of destruction and instead staggers off to bed. Thus, in the Egyptian flood story, the flood saves the human race. Yet another flood story that differs significantly from the biblical one is found in Norse myth. Odin and his two brothers, Villi and Ve, kill the frost giant, Ymir, and make the world out of his body. His blood creates a flood that drowns most of the other frost giants. All this happens before the creation of the human race. There is no native Celtic flood myth. I have to stress the word “native” since the Celtic myths, like those of the Teutonic peoples were written down by Christian monks, who harmonized them with myths from the Bible. Here is yet another problem with the vaunted universality of flood myths: Many of them appear courtesy of cultural contamination by Christian and, in some cases, Muslim, missionaries. Diffusion of flood myths is also a factor. While there are differences between earlier Mesopotamian myths and the story of Noah’s ark, and while there is not a literary descent from the earlier material to the later, there is a cultural continuity. Thus, the Akkadian flood epic, Atrahasis, gave rise to later flood tales, not only the story of Noah in the Bible, but, as well, that of Deucalion and Pyrrha in Greek mythology. We do not find, nor would we expect to find, any great literary correspondence between an Akkadian epic, written on preserved tablets dating from ca. 1650 BCE and the biblical flood myth, the earliest version of which probably dates from ca. 850 BCE. Tereh took Abrahm his son and Lot, the son of Haran, his grandson and Sarai his daughter-in-law, his son Abrahm’s wife, and he went forth from Ur of the Chaldeans to go into the land of Canaan; but when they came to Haran they settled there. While this test purports to be from the hand of Moses, written sometime between 1400 and 1200 BCE, the Chaldeans did not occupy Ur until ca. 800 BCE. Hence, this document’s reference to Ur as “Ur of the Chaldeans” dates it as having been written after that time. Chris White would do a great service to the cause of critical thinking, and to himself as well, were he to excise the flood material from his otherwise exemplary documentary. Any time you read creationist attempts to claim Noah’s flood was real, they point to the Grand Canyon or cherry-pick a flood event in a local region and claim there was once a giant flood that could cover the entire earth. Such claims show that creationists not only don’t know much about real geology and have never looked at very many real outcrops, but also that they don’t know history. The first detailed attempt [to revive the “Noah’s flood geology” model] came from a Seventh-Day Adventist schoolteacher named George Macready Price, who published a series of books starting in 1902. Price had no formal training or experience in geology or paleontology, and in fact attended only a few college classes at a tiny Adventist college. But inspired by Ellen G. White, the prophetess and founder of the Seventh-Day Adventist movement, he dreamed up an explanation called “flood geology” and aggressively promoted it for more than sixty years until his death in 1963. According to Price, the Flood accounted for all of the fossil record, with the helpless invertebrates being buried first, and the larger land animals floating to the top to be buried in higher strata, or fleeing the floodwaters to higher ground. Clark’s statement is a classic example of a reality check shattering the fantasy world of the flood geologists. Unfortunately, most creationists do not seek scientific reality. They prefer to speculate from their armchairs and read simplified popular books about fossils and rocks, rather than go out in the field and do the research themselves, or do the hard work of getting the necessary advanced training in geology and paleontology. In the 1950s the young seminarian John C. Whitcomb tried to revive Price’s ideas yet again. When Douglas Block, a devout and sympathetic friend with geological training, reviewed Whitcomb’s manuscript, he “found Price’s recycled arguments almost more than he could stomach. ‘It would seem,’ wrote the upset geologist, ‘that somewhere along the line there would have been a genuinely well-trained geologist who would have seen the implications of flood-geology, and, if tenable, would have worked them into a reasonable system that was positive rather than negative in character.’ He assured Whitcomb that he and his colleagues at Wheaton [College, an evangelical school] were not ignoring Price. In fact, they required every geology student to read at least one of his books, and they repeatedly tested his ideas in seminars and in the field. By the time Block finished Whitcomb’s manuscript, he had grown so agitated he offered to drive down to instruct Whitcomb on the basics of historical geology” (Numbers, 1992, p. 190). In 1961, Whitcomb and hydraulic engineer Henry Morris published The Genesis Flood, where they rehashed Price’s notions with a little twist or two of their own. Their main contribution was the idea of hydraulic sorting by Noah’s flood, where the flood would bury the heavier shells of marine invertebrates and fishes in the lower levels, followed by more advanced animals such as amphibians, reptiles (including dinosaurs) fleeing to intermediate levels, and finally the “smart mammals” would climb to the highest levels to escape the rising floodwaters before they are buried. The first time a professional geologist or paleontologist reads this weird scenario, they cannot help but be amazed at its naiveté. Price, Whitcomb and Morris apparently never spent any time collecting fossils or rocks. What their model is trying to explain is a cartoon, an oversimplication drawn for kiddie books—not any real stratigraphic sequence of fossils documented in science. Those simplistic diagrams with the invertebrates at the bottom, the dinosaurs in the middle, and the mammals on top bear no real resemblance to any local sequence on earth. In fact, those cartoons show only the first appearance of invertebrates, dinosaurs, and mammals, not their order of fossilization in the rock record (since invertebrates are obviously still with us, and are found in all strata from the bottom to the top). This diagram is an abstraction based on the complex three-dimensional pattern of rocks from all over the world. In a few extraordinary places, such as the Grand Canyon, Zion, and Bryce National Parks in Utah and Arizona, we have a fairly continuous sequence of a long stretch of geologic time, so we know the true order in which rocks and fossils stack one on top of another. But even in that sequence, we have “dumb” marine ammonites, clams, and snails from the Cretaceous Mancos Shale found on top of “smarter, faster” amphibians and reptiles (including dinosaurs) from the Triassic and Jurassic Moenkopi, Chinle, Kayenta, and Navajo formations. Just to the north, in the Utah-Wyoming border region, the middle Eocene Green River Shale yields famous fish fossils have been quarried by commercial collectors for almost a century. The Green River Shale produces fossils not only of freshwater fish, but also freshwater clams and snails, frogs, crocodiles, birds, and land plants. The rocks are finely laminated shale diagnostic of deposition in quiet water over thousands of years, with fossil mud cracks and salts formed by complete evaporation of the water. These fossils and sediments are all characteristic of a lake deposit which occasionally dried up, not a giant flood. These Green River fish fossils lie above the famous dinosaur-bearing beds of the upper Jurassic Morrison Formation in places such as Dinosaur National Monument, and above many of the mammal-bearing beds of the lower Eocene Wasatch Formation as well, so once again the fish and invertebrates are found above the supposedly smarter and faster dinosaurs and mammals. In addition to the examples just given, there are hundreds of other places in the world where the “dumb invertebrates” that supposedly drowned in the initial stages of the rising flood are found on top of “smarter, faster land animals,” including many places in the Atlantic Coast of the United States, in Europe, and in Asia, where marine shell beds overlie those bearing land mammals. In some places, like the Calvert Cliffs of Chesapeake Bay in Maryland or Sharktooth Hill near Bakersfield, California, the land mammal fossils and the marine shells are all mixed together, and there are also beds with marine shells above and below those containing land mammals! How could that make any sense with the “rising flood waters” of the creationist model? In short, the “flood geology” model was rejected by trained, experienced geologists (who also happened to be creationists) over 170 years ago, and has not been taken seriously since then. Real geology has proven enormously powerful, for without it we would not have the fossils in our museums or our understanding of geologic history. Without it, we would never find oil, gas, coal, or many other economic deposits that are based on understanding real geology, not theological fantasies. If “flood geology” were still in use by real geologists, we would have none of these benefits. Gould, S.J. 1994. “Hooking Leviathan by its Past,” pp. 375–396, in Gould, S.J., Dinosaur in a Haystack. W.W. Norton, New York. Numbers, R. 1992. The Creationists: The Evolution of Scientific Creationism. Knopf, New York. Whitcomb, J.C., Jr., and H.M. Morris. 1961. The Genesis Flood. Presbyterian and Reformed Publishing Co., Nutley, NJ. Why does so much material in the Bible seem repetitive and even contradictory? What is the evidence that Bible stories of the creation, the race of giants, the flood, and the tower of Babel were derived from earlier tales told by the Sumerians and pre-Israelite Semitic peoples? How does linguistic analysis of Biblical names reveal their original hidden meanings. Many intelligent and otherwise well informed readers will find much of the material in this book new and quite startling, although Bible scholars, and anyone with a background in comparative mythology will be familiar with it. This book has received rave reviews. The 1st edition sold out in weeks. Get up to speed on the latest discoveries. One of the best books explaining evolution and new discoveries of the incredibly rich fossil record; plus a no holds barred critique of the claims of creationism and Intelligent Design. Over 200 illustrations. University of Oxford research psychologist Dr. Kevin Dutton reveals that there is a scale of “madness” along which we all sit. Incorporating the latest advances in brain scanning and neuroscience, Dutton demonstrates that the brilliant neurosurgeon who lacks empathy has more in common with a Ted Bundy who kills for pleasure than we may wish to admit, and that a mugger in a dimly lit parking lot may well, in fact, have the same nerveless poise as a titan of industry. Dutton argues that there are “functional psychopaths” among us—different from their murderous counterparts—who use their detached, unflinching, and charismatic personalities to succeed in mainstream society, and that shockingly, in some fields, the more “psychopathic” people are, the more likely they are to succeed. Dutton deconstructs this often misunderstood diagnosis through bold on-the-ground reporting and original scientific research as he mingles with the criminally insane in a high-security ward, shares a drink with one of the world’s most successful con artists, and undergoes transcranial magnetic stimulation to discover firsthand exactly how it feels to see through the eyes of a psychopath.